Wisconsin Gov. Scott Walker, a conservative Republican who briefly sought his party’s presidential nomination in 2016, proposed on Tuesday boosting his state’s version of the Earned Income Tax Credit for low and moderate-income working families. Walker’s proposal, part of his new two-year budget submission, marks a sharp turnabout by the governor that will help more than 130,000 working poor families in the state by restoring more than $20 million a year that he cut from the program in 2011. The changes, if approved by the legislature, would provide added benefits to families with only one child, non-custodial parents and newly married parents who all received reduced benefits under the existing tax credit system. For a hardline conservative Republican who favors tough restrictions on food stamps, Medicaid, and other social safety net programs, Walker’s call for bolstering the EITC is revealing about the broad-based, bipartisan support that the tax credit has enjoyed at the state and federal level. The EITC, created by Congress in 1976, was designed as a powerful tool to encourage work and to increase the take-home pay of struggling low and moderate income families and individuals. By 2014, the federal government was handing out $56 billion a year in direct payments to families and individuals who qualified for the program. Over time, however, the program suffered from continuous administrative problems, the controversy over giving billions to illegal immigrants, and more than $130 billion of overpayments. The EITC, administered by the IRS, is a soft target for fraud because although the IRS can identify a false claim, it has no authority to rectify it. Nevertheless, the tax credit program became so popular that 26 states and the District of Columbia created EITC’s of their own to supplement the federal coverage. The amount of EITC hinges on a recipient’s income, marital status and number of children. Parents with annual incomes of between $39,300 and $53,500 may qualify for the EITC while working poor people with no children and incomes below $14,900 may qualify for lesser benefits, according to the Center on Budget and Policy Priorities. The amount of credit rises with earned income until it reaches a maximum level and then begins to phase out. What’s more, the EITC benefits are “refundable,” meaning that in the event the credit exceeds a low-wage worker’s income, he or she would receive a refund from the Internal Revenue Service. Many conservatives supported the EITC because “it’s clearly a hand-up, not a handout” program, Jason Fichtner of the Mercatus Center at George Mason University and Indivar Dutta-Gupta of the Georgetown Center on Poverty and Inequality recently wrote in The Hill. At the same time, they said, many Democrats and progressives championed the EITC because it not only encouraged work but ameliorated inequities in state and local tax systems that often forced working-poor families to pay a disproportionate share of their income in taxes when compared with wealthier people. Over the decades, Republican and Democratic administrations alike have supported improvements in the EITC, and both President Trump and his Democratic opponent, Hillary Clinton, supported further expansion of the program during the 2016 campaign. Trump proposed allowing working parents to deduct child-care expenses from their income taxes for up to four children and elderly dependents. His plan would also offer rebates to lower-income taxpayers through the existing Earned Income Tax Credit. The Trump campaign estimated that a low-income family could save almost $1,200 per year. 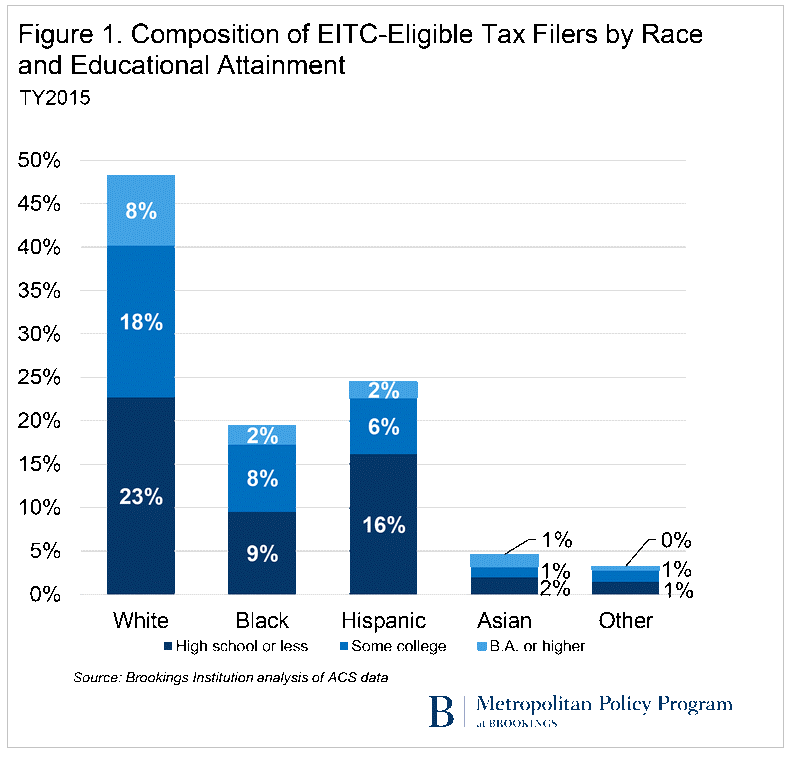 A new analysis of the EITC by the Brookings Institution published this week argues that the tax credit almost certainly enjoys solid bipartisan appeal today – regardless of rancor on other issues -- because it “reaches across the demographic divides that characterized the 2016 election,” particularly those of race and education. The Pew Research Center reports that 67 percent of white voters without a college degree voted for Trump last fall compared with just 28 percent who voted for Clinton. Meanwhile, Clinton captured large margins among black and Hispanic voters. The new Brookings study shows that the EITC benefits significant numbers of both these groups – both in rural areas and more diverse metropolitan areas. “This is all to say that the EITC is a critical piece of the nation’s safety net, and one that is already reaching many of the workers and communities struggling with the kinds of economic uncertainty and vulnerability that have attracted national attention in the wake of the election,” wrote Elizabeth Kneebone, a fellow at the Brookings Metropolitan Policy Program, and Cecile Murray, a research assistant. House Speaker Paul Ryan (R-WI) is another big booster of the EITC because of its focus on rewarding work – a central theme that has run through many of his proposals for overhauling federal health care and welfare programs. Trump and the Republicans would likely support the inclusion of new EITC provisions in the major reform of the federal tax code they are pushing for later this year, and would almost certainly gain liberal support from Sens. Bernie Sanders (I-VT) and Elizabeth Warren (D-MA). However, with so much uncertainty over the fate of the GOP agenda, particularly health care reform, and taxes, forecasts of improvements in the EITC are murky at best.